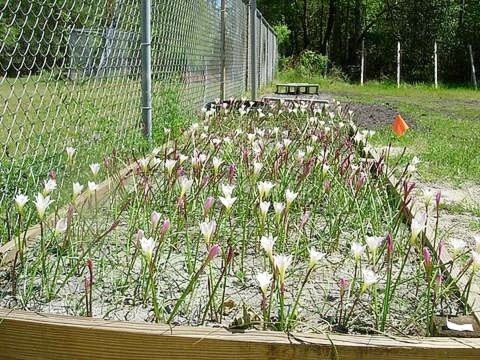 Spring 2007: A total of 1,166 bulbs of the Rain Lily, Zephyranthes simpsonii, a threatened species, were moved from the right of way across from Bill's Seafood, to the Brunswick County Cooperative Extension Agency. 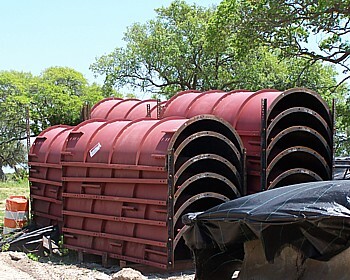 They will continue to grow there until the bridge is completed. 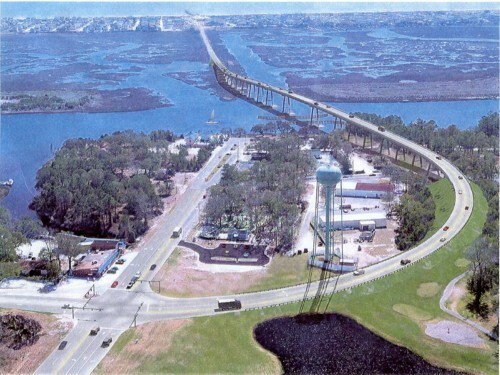 Then they will be replanted near the mainland base of the new bridge. Melissa Miller, NCDOT Environmental Biologist, supervised the relocation. Photos were taken by Environmental Biologist Melissa Miller. 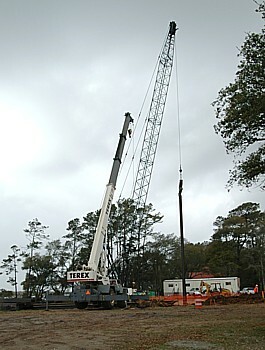 February 19, 2008: English Construction staff, along with NCDOT engineers, arrived on the site. Soon afterwards they began to clear trees and do other preliminary tasks. 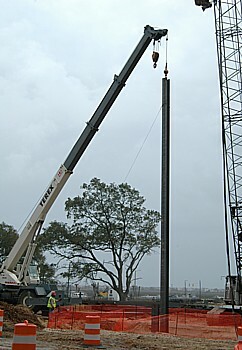 March 31, 2008: On a drizzly day, English Construction Company began to lower the first pile. 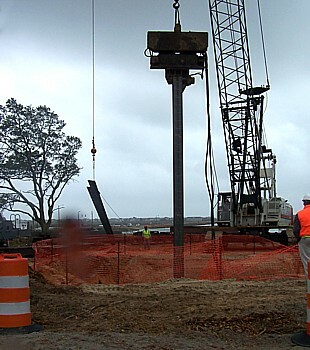 April 25, 2008: Since I posted photos of the first and second enormous piles being hammered into the ground, more have been inserted. 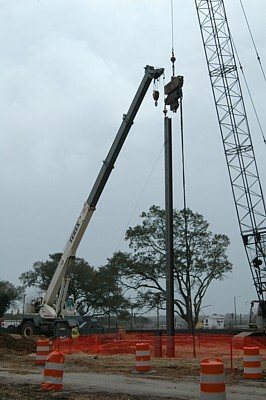 Green re-enforcing steel known as rebars was placed along side each pile. 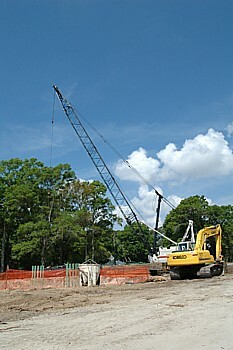 A large concrete footing was poured to hold the piles and rebars in place. 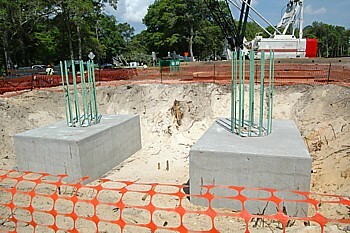 Four footings have been constructed. 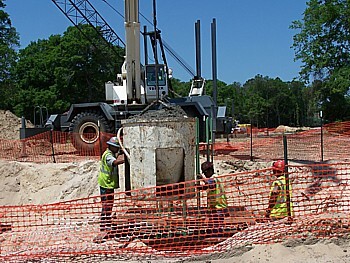 This photo shows two footings. 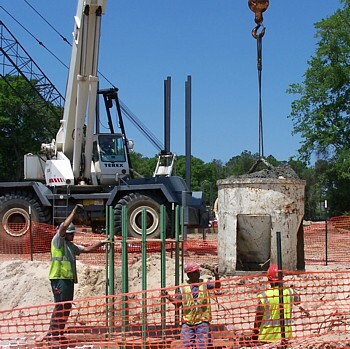 One bridge support column will be erected around each circle of rebars on each footing. There will be more than 40. 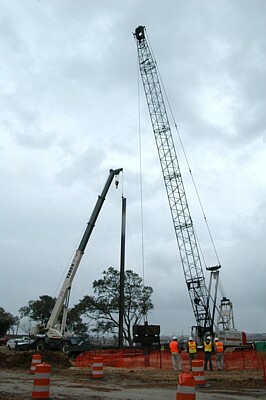 Workmen are welding behind an idle crane. 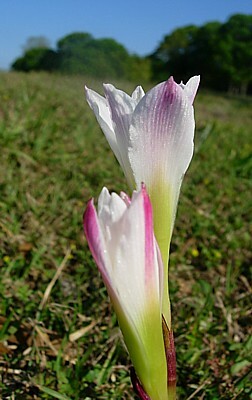 April 30, 2008: Once again my white balance was off. Sorry. 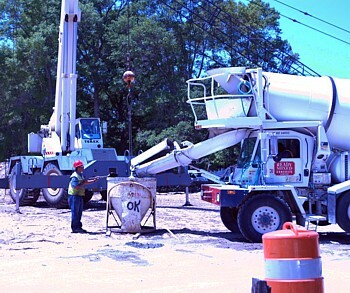 This shows one of several cement mixers pouring concrete into a bucket. 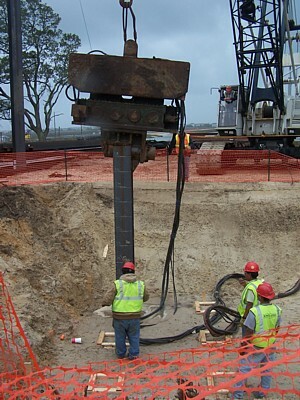 The concrete was to make two more footings around rebars. 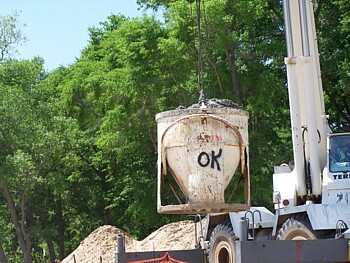 The bucket being lifted by a crane -- photo from a different camera. 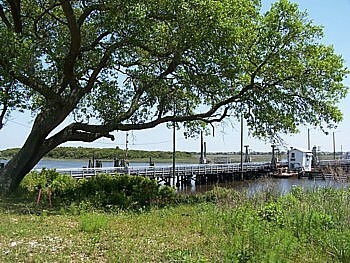 Near the dust, pounding and enormous construction vehicles, several Live Oaks remain, this one enshrouding -- as always -- the old Sunset Beach Bridge.